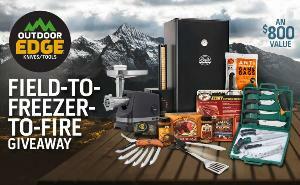 Prize: Win an Outdoor Edge RazorPro, GameProcessor, and GrillBeam light-up Spatula-Tong, a set of Koola Buck Antimicrobial game bags, a Weston meat grinder/sausage stuffer, a Hi-Mountain jerky board with assorted seasonings and a Bradley Smoker. Statistics: This contest was opened by 85 and entered by 5 ContestChest.com members. 6% of those who opened the contest, entered it.